"If someone thinks they are going to walk around campus smoking a joint, it's not going to happen," University of Washington spokesman Norman Arkans says. "We get caught in the vice between the state law and our obligations under the federal government. 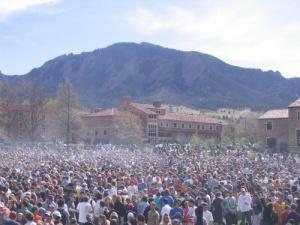 While it may be legal two blocks off campus, it will be illegal under federal law, so it will be illegal on campus." Other schools' officials quoted were less certain, saying they'll need time to figure out what the law means now and how the feds will interpret it. I tend to think that there is something to what Arkans says, but only as far as it goes. School administrators, or at least the good ones, see federal requirements as forcing them into taking punitive measures in some cases when they'd see other approaches as more constructive. In practice that means they have more latitude to show lenience or to look the other way before a drug offense gets documented than after. But one of the ways that drug offenses get documented is through arrests. With fewer arrests, there will be less documentation, hence more opportunities to either work with a student who might have a problem, or to let something go. As the article points out, the initiatives only legalized possession for persons 21 and over, whereas a majority of students on many campuses are under 21. I suspect that the climate will improve for people under 21 who are caught with marijuana, despite continued illegality, but only time will tell. By the way, the Drug-Free Schools and Communities Act is also one of the reasons schools don't like smoke-outs. Students shouldn't really want to walk around campus smoking a joint, no more than they should want to walk around campus with a bottle of liquor... they are there to learn. That being said, the federal government shouldn't be forcing these colleges to implement these rules with sanctions. This should be implemented at the individual organization's level.